Carbon monoxide (CO) can cause serious health problems when people and pets are exposed to high levels of the chemical. Homeowners should understand that appliances like a furnace or water heater can cause a CO buildup. To help you prevent it from occurring in your home, here are a few causes of carbon monoxide. John Hopkins Medicine recommends using fuel-burning space heaters only in well-ventilated areas. This extra space will help disperse any CO buildup to safer levels to prevent health issues. If your home features a fireplace, have a professional clean the soot and smoke buildup each year before using it. Getting an annual cleaning will mitigate the risk of clogs that can send carbon monoxide back down the chimney and into your home. When you move into a house, have a ventilation expert assess the gas stove to ensure the fumes are being funneled outside. If it’s improperly ventilated, a gas stove can create dangerous carbon monoxide buildup in your home. Many Minnesota residents leave their vehicles running in the garage for a few moments to warm the car up in the winter. Only follow this practice if the garage door is wide open to let out exhaust fumes. Otherwise, your family may be susceptible to CO poisoning due to chemical buildup in the air. Additionally, you can ensure the furnace heats the garage, so you don’t have to worry about turning the car on to warm it up before driving. If your home has a gas-fueled water heater, have it inspected annually to ensure it’s running properly. A professional will assess the fuel lines and make any repairs necessary to ensure it uses fuel efficiently and isn’t leaking a potentially harmful gas. 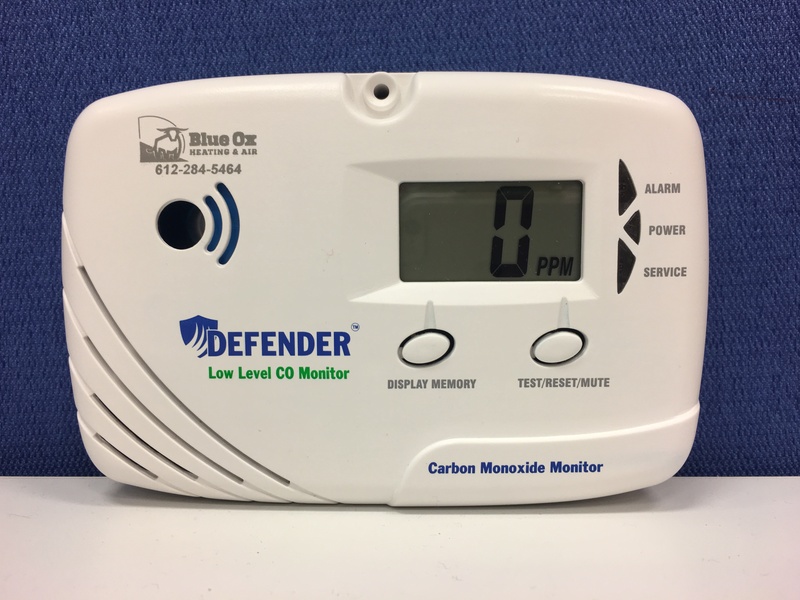 Homeowners looking to prevent carbon monoxide poisoning should consider purchasing a Defender® Low Level CO Monitor from Blue Ox Heating & Air in Hennepin County, MN. This Defender monitor uses a long-lasting lithium battery to alert families when the CO level is too high because of a faulty furnace, gas stove, or another cause. Call (612) 326-3837 to learn more about this Defender monitor—$149 until February 14. Visit their website for more information on their furnace and air conditioning services.